The Tizzard's have reported Thistlecrack to be in peak shape, ahead of the Betfair Chase at Haydock this weekend. Injury has ruled Thistlecrack out of the last two Cheltenham Festivals, and the 2016 King George winner has not won since that Kempton victory. He has not been seen entirely since last year's renewal - when finishing a gutsy fourth to Might Bite, but trainer Colin's son and assistant Joe, believes the ten-year-old is still a serious Gold Cup contender, on what will be surely his last shot at the Cheltenham feature. 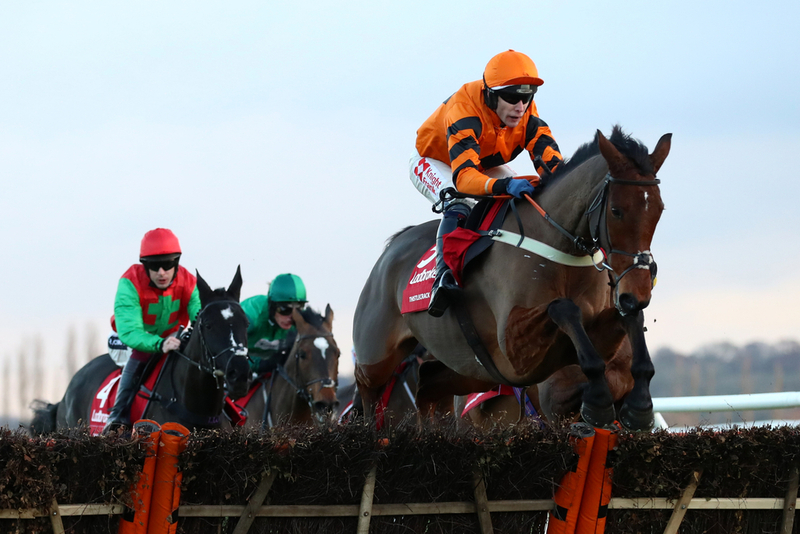 (Credit: Racing Post) He said: "Thistlecrack has been back in since July and he was ready to run in the Charlie Hall but the ground went against him, so we are going to the Betfair Chase on Saturday. "He's getting older, and this is probably his last season to be at the top of his game. We'll need to get him out into these big races as often as possible. "It's been frustrating. After he won the King George we were so excited about running him in the Gold Cup but we still think we have got one more chance with him." Last week Exeter racegoers were treated to a racecourse gallop in which the 10yo worked alongside his stablemate and last season's Gold Cup winner Native River. Tizzard said: "The question mark with him is are we going to get him back to his best? At home we think we have, he has worked particularly well and he moves well. At Exeter I thought he looked fantastic but it is just whether he can do it on the course, and fingers crossed he will. "We were always fighting a battle with him last year and he was never 100 per cent sound. We ran him at Newbury knowing it would bring him on and then at Kempton he ran a good race. He came back sore and got a stress fracture but now he is ready to go again. Arguably, Thistlecrack's most memorable race was last year's Cotswold Chase at Cheltenham, where he was turned over at short odds by the 2015 Grand National Winner Many Clouds, who sadly lost his life after the race. It was, an epic battle.